Relax or workout. The Monterey boasts a 4-in-1 inflatable float system: hammock, lounge chair, exercise saddle, and Drifter. The Multi-purpose lounge quickly converts for relaxation, socializing, and even exercise in the pool. Lounge features comfortable coolweave fabric and folds easily for portability. Easily inflate and deflate with duolock inflation system. 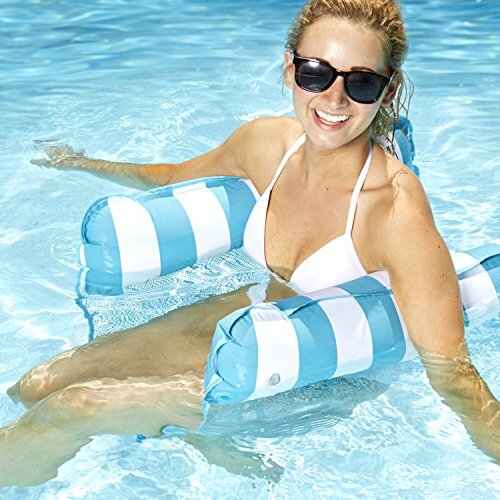 The Monterey inflatable float system is a great addition to the summer pool this season and delivers fun so you can socialize, relax and even exercise. Features the cooling comfort of luxurious coolweave fabric which Contours comfortably to your desired floating need. Ages 15 and up/weight Capacity 220lbs delivering after inflation a floating 44 in floating surface. If you have any questions about this product by Aqua, contact us by completing and submitting the form below. If you are looking for a specif part number, please include it with your message.